Greetings to you. 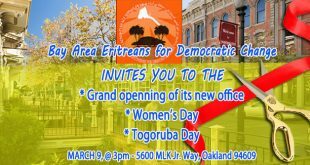 The purpose of this writing is not to comment or write an article regarding the ever-deteriorating situation of our Eritrea, the countless undemocratic actions of the Asmara regime or other related stuff. 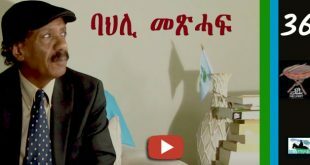 It is also not intended to comment about the famous or infamous writer by the name Ali Salim, who is becoming one of the most talked about and debated figures among Eritreans of all kinds of political affiliations and walks of life. Though I might have something to say later on, right now that is not what I am writing to you about. I had been in journalism and newspaper /media business since 1995. From “Rim” magazine and newspaper (one of the first to be published after Independence) to the time of the closure of independent media and the massacre of its heroic journalists and my colleagues, till this day, I have been following and involved in the struggle of free press and independent media. Life as an exiled and refugee is tough for almost every one. Life will be tougher for an exiled journalist and it was more so for an exiled Eritrean journalist, working and living among one of the most duped, deceived and hypnotized societies the world has ever seen. With the exception of some fanatical North Korean exiles living In Japan and other countries, for a long time, many Eritreans were the most confused, conned, tricked and amazingly ignorant people I have ever seen in my short life. Though the wall of ignorance and deceit is slowly crumbling and quite a number of Eritreans are awakening from their deep sleep and dream, it was not easy for many right-minded, progressive and peace-loving Eritreans for a long time and I am sure you know what I mean. It is hurting to see the brutal and bestial Asmara regime being naked and exposed day by day and to see many of its worshippers either fleeing the hellish HIGDEF republic or realizing their deadly mistake. I just got a call from a relative the other day. He was an ardent HIGDEF supporter and worshipper, Isaias as his deity. There were times he compared Isaias, the child killer with Jesus Christ the prince of peace, I am not making this up. I can even give you his number and you can talk to him. After his stupid, midget wife’s trip to the hellish Republic of Enda Isaias and after the death of his younger sister in the Mediterranean Sea and the arrest of another Pentecostal sister in Asmara, he awakened from his dream and nightmare and we talked at length and he uttered the word: ”SEBAY TESAWITULNA NAY BHAQI ITI SEBAY TIINA SIINU ALO………….” (The guy, Isaias tricked or deceived us, for sure this man is not in his right mind). To hear this from my long time HIGDEF- worshiping, Isaias-shoe-licking, illiterate cousin is one of the most gratifying things that ever happened to me. I am not going to comment more on that, as I said, my purpose of this writing is not to comment on the current affair and state of the nation, of the motherland, or the coward HIGDEF apostles. More might come on later days, God willing of course! I was following and been writing to your website for quite some time now. Your website, especially the GEDAB news section was the source of breaking news and hard-to-get information for my paper and other independent papers back in the days. 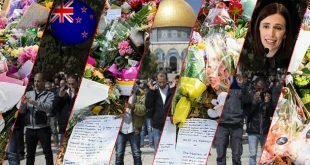 GEDAB news and breaking news, is different from other sites, in that its report is almost always true and this being done from one of the most closed societies in the world, is a feat in itself. 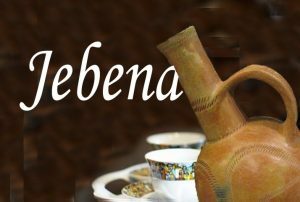 Awate is also a forum for discussion, debate and a medium for many Eritrean writers and aspiring writers. You give platform to all kinds of writers. Some of your writers are highly talented and skilled, there are days I envy them for their amazing writing and persuasion skills. There are also writers, full of hate and uncontrolled rage, that I learned almost nothing from. There are writers on your website, who are powerful debaters and accomplished essayist, who are for peace, brotherhood, and democratic rights respecting Eritrea. There are writers at your website too, who are so demagogue and hate mongers, there are times that I shrieked in fear and I curse the writer! You have all kinds of writers and essayists, some professional some not so. As I tried to make it clear, I am not commenting on the merits or demerits of the opinion by Semere Tesfai (wedi St.Louis) Or others. I am not a seasoned politician or activist to comment on this. What I am concerned most and interested in is the fact that such kind of criticism and even condemnation, given a stage and a space by Awate.com, with out any kind of editing, censuring and suppressing! I am interested in free speech and the right of every one to express him/her self with out any restriction and censorship of whatsoever. That is why I am a little amazed by Awate’s stand and style. I can site many examples too for your site’s allowing articles highly critical and totally divergent from what you stand for. Initially I thought you were just pretending and only for short period of time. But this stand of yours for freedom of speech and writing and freedom of expression has been consistent for some time now and I am proved wrong. Esteemed readers, the question of censorship and editing and outright cutting of mine and other’s writings and ideas, has been a very sensitive and personal issue to me. Every time my articles are censored, thrown away, or edited, I take it personal and really despise those censors, anti freedom of speech, fake democrats and pseudo liberals, who despite living in the peaceful, democratic constitutional governments of the west, they live and act just like the hated HIGDEF, our unending, nightmare. If you don’t believe me just try to send an article highly critical of a certain website and see what will happen. The other day, I was able and honored to attend a meeting with the esteemed Eritrean fighter and MENQAA movement or rebellion massacre survivor, the respected Eritrean father Memhir Tesfu Zewde. The meeting was a phenomenal event to me and to many Eritreans who were attending the speech by Memhir Tesfu in Washington DC. For most of us, it was the first time to see a survivor of the fascist EPLF/PFDJ purge and brutal carnage of the 70’s. After the meeting, I summarized the meeting and prepared reportage to be sent and posted in some of the prominent websites. No one was willing to post this simple reportage and news article, except Togoruba.com and I want to thank www.togoruba.com and its editors for their generosity. Why the other websites refused to entertain this simple reportage is beyond my understanding. If you censor and refuse to post in your website, the ideas and speeches of a great Eritrean survivor and war hero like Memhir Tesfu, then we better stop here. This is just a recent example and there are many similar experiences that the writer and others encounter, here in the west of all places. So far with the exception of Awate.com, almost all of the websites and media outlets do censor writings and ideas by this and other writers with differing degrees and frequency. The only problem I encountered with Awate is that they want an article to be sent exclusively to them and they don’t like duplicity or sending to other websites, which I strongly disagree. I like and highly appreciate Awate’s stand in regard of freedom of writing and free press. 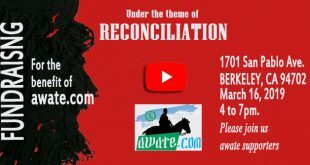 It is not that Awate is my only favorite website or I am part of a large pool of Awate writers. There are very good writers and my favorite writers in Awate website and there are also other writers, I don’t even want to finish reading what they are trying to say. THE MOST IMPORTANT POINT IS, GIVING EVERY ONE A PALTFORM AND MEDIUM TO AIR, SPEAK AND WRITE WHAT HE/SHE FEELS, AND IN THIS I GIVE AWATE.COM AN A++. I might not agree with what the current sensation Ali Salim and The Ali Salims of the day wrote. There are a lot of crucial issues to our survival as a nation, important, eye opening and dire issues in Ali Salim’s writing and even manifesto for lack of a better word. Do I agree with what he is saying all the times? No! Are there timely issues and national agendas that we ought to discuss and possibly try to solve before it is too late? Absolutely! The most important, and I repeat, the most important thing for me is not Ali Salim’s rant or sometimes legitimate cry for justice. As I said I’m not going into detail for now about this. 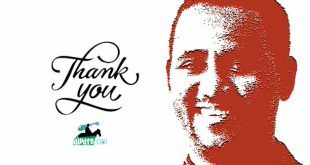 But what I found as exceptional is the right of people like Ali Salim’s and others to speak and write freely and the fact that Awate.com’s is willing to provide a forum and a medium for such kind of writers and personalities even, to me is the first litmus test of freedom of speech! As a journalist that is what most concerns me and that is what I am looking for in any kind of media outlet. Even if some one says” Senhit should be a separate republic with Keren as its capital, I have to respect his right to say so. Do I agree with such kind of sentiment? No. But does anyone have a right to say Aqordat should be a capital city of Eritrea? Or worse, does any one has a right to say” we should establish people’s democratic republic of Akeleguzay and we should secede from the rest of Eritrea? Yes! Do I agree with such kind of feelings? Absolutely not! Are there people who feel like this? Who knows? But to deny a person, the right to say and write what he/she feels because you don’t agree with what he stands for, is one of the worst kinds of censorship and anti democratic activities. LET ANYONE SAY WHAT HE/SHE FEELS AND LET’S NOT BE AFRAID OR TREMBLE BY OTHER’S VIEWPOINT. 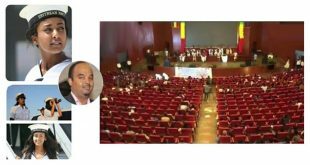 Almost all the so-called opposition camp websites are eager and happy to entertain articles that denounce the barbaric regime in Asmara. Try to send any article entitled” Fascism in Asmara………….”. You will find it posted beautified by twenty colors the next day! Try to send an article entitled “ Eritrean government’s achievements in the area of health care or reduction of child mortality… or “ Muslims of Habero Sahel region are facing discriminations at the hand of an administrator” Or try to send an article entitled the “ELF’S hidden crimes in the 70’s…” to nharnet.com……. You better search in Mars or Jupiter for your article! Or try to send an article entitled” The Afars of Eritrea should be given an autonomous status.” With the exception of Awate.com, I guarantee you no one will post such scary article in their websites! The other kind of censorship or quasi censorship is like what happened to our Brother and fellow journalist Habtom Yohannes. (Please see http://www.awate.com/portal/content/view/5410/5/) Changing and altering words, phrases and the whole sentences just to fit to your opinion is uncalled and unprofessional and even a crime in many nation’s laws and regulations. It shows the so called named interviewer’s lack of professionalism or how far he goes to satisfy his opinion at the risk of the reader. As they say, time and again, an opinionated journalist is a propagandist and a dangerous one at that. In this case it is not only brother Habtom’s rights that are violated, but the entire readers and audience’s too, and that is simply shameful. The concerned website should apologize to say the least. So, to come to my point, where is the free press that all are shouting and denouncing the Asmara regime for? If you don’t respect the rights of others to speak and express what they feel, then you don’t have any right to denounce the Asmara regime or speak about democracy and free press, because you are simply a hypocrite and a pseudo democrat who may even be worse than the current PFDJ regime. If you are willing to allow only articles that condemn the Isaias regime, then you are a simple one sided propaganda tool and you have nothing to do with free press. Free press and the right of freedom of speech means giving every one equal opportunity and allowing and tolerating of ideas, even if you don’t agree with. OR PUT IN YOUR WEBSITE’S FRONT PAGE LOGO ”WE WILL ALLOW ONLY ARTICLES THAT ARE ANTI-PFDJ REGIME AND ANY THING ELSE WILL NOT BE POSTED” Do that and stop playing with free press, as it is so sacred to be toyed and abused by the likes of you and when I say you, I mean most of the websites who failed the simple test of freedom of speech and freedom to express and write what you feel. Some website owners and editors might argue that they have the right to ban, censor or out right throw an article into a trash bin. Do they have such rights and power? Yes. But here is the catch; if you expurgate, ban, suppress, censor, edit or cut some one’s idea or the right to speak, then why do you denounce the Asmara regime day and night because you are the cloned version of the HIGDEF administration and why do you waste your time pretending to be for free press and freedom of citizens to express their grievances and the right of freedom of speech? Why don’t you try to merge with the” Alenalkis” and the “dehais” and form a bigger monster? If you don’t have the guts or the courage to entertain ideas and attitudes way different than what you believe or what your mother been telling you for ages, then you are not for free press and freedom of expression at all. YOU ARE SIMPLY A POWERLESS AND TOOTHLESS HIGEDF, THE ONLY DIFFERENCE BEING THE MONSTER IS IN POWER IN ASMARA AND YOU ……..GOD KNOWS WHERE. What assurance does any Eritrean journalist have from being arrested or tortured the day you come to power? 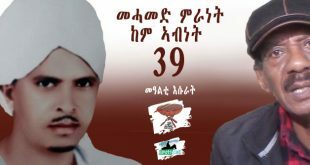 What guarantee does any Eritrean citizen have from being jailed or even be killed for just expressing his grievances? We shouldn’t be afraid or tremble with fear of any idea or philosophy. We shouldn’t be scared of complaints and grievances, both logical and illogical. An idea or ideology logical to me might be absurd to my fellow citizen, and vice versa, but I shouldn’t deny or suppress the right to express, simply because I don’t like an idea. Open mindedness and accepting other viewpoints is the highest form of virtue. Let the people and the majority decide, and respect even then, the right of the minority to articulate and defend what it feels without any fear of retribution, degradation or vilification, as is the case now a days. Respect others and you will get respect and try to disrespect anyone, expect to be smitten and no one will feel sorry for you. Today the world is changing so much. Some years ago, to speak Kurdish in Turkey was a crime punishable by years of jail sentence. Today there are dozens of Kurdish television stations beaming from Ankara and hundreds of Kurdish language newspapers and periodicals. Some years ago the Kurds were looked upon and were persecuted viciously in Iraq by Saddam and others before him; today Iraq has a Kurdish foreign Minster and a Kurdish President! For long time, the Shiites in Lebanon were considered as poor, illiterates and destined to be porters (coolies) only. Today anyone with a simple radio will know how powerful and strong the Shiaas of Lebanon are. For a long time the Tigreans in Ethiopia were considered as poor, beggars and famine stricken both by racist Eritreans and chauvinist Amahra Elites. 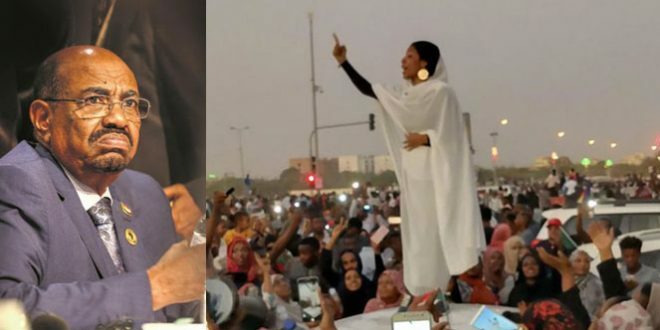 Today how many Eritreans are feeling to Tigray and how powerful the Tigreans are becoming in front of our eyes and how they have transformed Ethiopia into one of Africa’s strong economy while we Eritrean are whining, moaning and biting every one else like wolves, is a tragic drama with Shakespearean proportions. In conclusion, I want to thank Awate.com for respecting freedom of press and the right of others to express their views. I believe it is almost only in your website that one can find different and divergent ideas and point of views. It is only your website so far that is free of the guilt and the inexcusable sin of censorship. Initially I thought you were just pretending, but this trend has been going on for years now and been consistent so far, so as a journalist and as victim of censorship and despotism, I thank you for your bold stance in regard to freedom of expression and giving many a chance to speak and air what they really feel and think. As I said it many times, I am not interested or want to debate on the merits or the points of many writers in your website and your editorials even. I may agree or might have differing views, and that is normal and natural. There are eloquent writers, politicians and activists who can debate, argue and defend way better than me in this regard. What I am interested in most is, the right and freedom of any one to express what he/she feels and believes with out any restriction and censorship. As a survivor of a brutal clamp down on free press back home in Eritrea, the issue of censorship and control of ideas has much meaning to me and I take it personal in most cases. I am writing or trying to write articles regarding diverse issues and topics, not because I have a lot of free time or I am paid by the websites or I am eager for my name to be mentioned or for entertainment or some form of fame. To be honest, I am ashamed and embarrassed to be an Eritrean in this day and age. Where democracy and free press are mushrooming almost everywhere else, I am a citizen of a nation where people are beaten like donkeys and millions live the life of a slave and live and die like a dog without any kind of dignity and honor whatsoever and there is no fame in that. Writing is a strenuous art and when you are an Eritrean writer or journalist where many low-life PFDJ shoe-lickers are eager to vilify you and your family, it is more so. As my hero the Iranian journalist Akbar Ganji used to say, “A truck driver is more peaceful profession than a journalist.” He was talking about Iran of course, but that applies to many countries as well. I am writing, out of deep pain, anguish of the catastrophe that has befallen my innocent and unsuspecting journalist friends. I am writing in order not to forget and abandon their sacrifice and martyrdom and as fitting memorial of what they have gone through and as a memory of the short but glorious time of free press in Eritrea. Me and other Eritrean journalists in exile, are fighting for the memory of the butchered and disappeared journalist colleagues of ours, not to be forgotten and to carry the torch of free press, till the judgment day arrives for the Eritrean people. That is the only purpose myself and other Eritrean journalists, who are fortunate enough to escape the slaughter against the press and our brothers, are writing and fighting for, in case you need reminding. 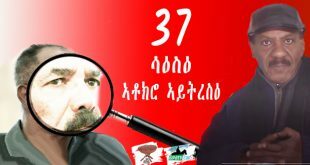 The recent formation of Association of Eritrean Journalists in Exile (AEJE) is a great leap forward in the struggle for freedom of press and the democratic rights of Eritreans to express what they feel, without censorship and suppressing or muzzling of any Eritrean’s right to write, speak or discuss any ideas. There are highly talented and qualified Eritrean media personnel and journalists all over the world. From Radio and TV broadcasting to print media, there are many unutilized Eritrean journalists and they are expected to do more now, with the new union in their side. To those censors and bogus freedom of press advocates, who are doing exactly what the HIGDEF tyranny is doing, I have a simple message to you: stop what you are doing and change your ways. Allow for different views to be entertained and don’t censor any one’s writing, article or idea. If you keep on acting like ENDA ZENA, I and my friends will not hesitate to name and shame you not only to Eritreans but to the whole world, interested parties, governments and journalist and free press organizations. 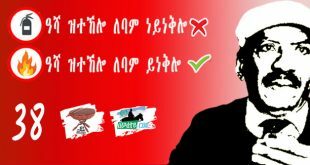 Eritreans are fed up of fake democrats and demagogue wolves in sheep clothing. 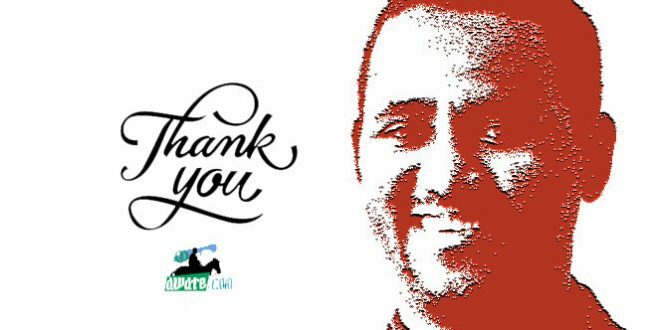 Thank you Awate.com for your strong stand with regard to freedom of press and giving many Eritreans of all walks of life, the medium to express their feelings that they are denied in their homeland. Keep up the good work.